The Comey hearing was extraordinary. 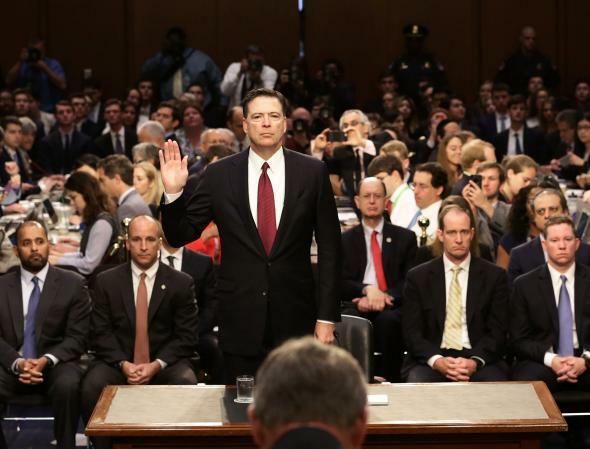 Former FBI Director James Comey is sworn in before testifing before the Senate Intelligence Committee in the Hart Senate Office Building on Capitol Hill on Thursday. But if Comey’s testimony wasn’t explosive, it’s only because Trump has forced us to become acculturated to the berserk. The utter shock of Comey’s firing, which was only a month ago, has mostly worn off. We’ve absorbed the stunning news that, according to Comey, Trump demanded his loyalty and asked him to quash the FBI’s investigation of fired National Security Adviser Michael Flynn. We’ve even gotten used to knowing that Trump boasted about Comey’s firing to Russian officials. Hopefully, these facts will come out soon. Indeed, Sen. Patrick Leahy announced plans to question Sessions about the Russia probe when he appears before the appropriations committee next week. The dam on the Trump Russia scandal didn’t break on Thursday, but it will keep leaking.